Happy Mother's Day to all you RBNY Moms! Our glorious team is back in action, this time in picturesque Chester, PA. That's right, it's another fixture against the DOOP boys @PPL Park (12:30pm ET, ESPN2, match notes here). 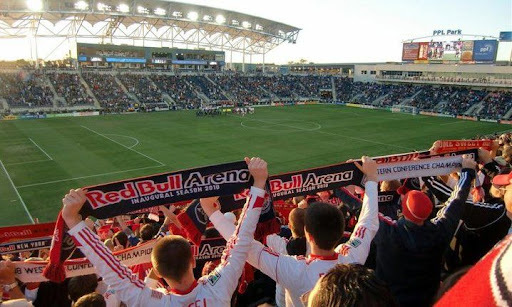 The Red Bulls have yet to take even a point out of PPL Park and the Union would, no doubt, like to see that continue. With that in mind, let's see how both teams come into this one. The Red Bulls are, with several key playes out of the line-up due to injuries and arrests, have managed three consecutive 1-Nil victories. The patchwork Red Bulls backline we've seen the past three games will need to work hard again as The Union will be hungry for all three points on offer today. The Union have not had a great start to their MLS season, having won only twice so far. The DOOP boys are struggling at the moment and are currently mired in 9th place (Eastern Conference). Philly has lost its last two MLS regular season games but are coming off a 2-1 midweek friendly victory against Germany's FC Shalke 04. Will the momentum from that victory carry over to today's MLS fixture? Red Bulls fans can only hope it doesn't. But enough of that, let's get to some predictions. I've been predicting wins in Philly for 2 years and we have yet to earn a single point there. So in the interest of reverse psychology I will go for a 1-0 Philly win and hope for the best. I'm of the belief that we can pull one out here. Our guys have been holding their own at the back and Tim Ream is no longer here to give it away to Philly. If Rafa Marquez doesn't play, then I'll predict a 4th consecutive 1-0 RBNY victory and our very fist @PPL Park. The Red Bulls have never won in Philly, but we've strung together 3 improbable victories now, so I have to go with a 1-0 RBNY win. The baby Bulls at the back will spoil the day for Philthy's mothers. Cooper's gotta be good for a cheap poacher's prize and Agudelo will come off the bench and exploit tired legs to score a brace. Key for us will be Dax keeping control to allow Lindpere to create chances. 0-3 win for NY. Belief being so important to winning I think we have a shot here. That is if Rafe is left out. I am thinking another one nil on a Philly own goal. Could you imagine that..3 more points without Henry. Anyway, Happy Mother's Day to my mom as she reads this site! That all for now! Happy Mother's Day and Let's Go Red Bulls!